Defense Secretary Robert Gates suggested today that he was open to allowing the media to photograph the flag-draped coffins of fallen soldiers as their bodies and remains are returned to the United States. “If the needs of the families can be met and the privacy concerns can be addressed, the more honor we can accord these fallen heroes, the better,” Mr. Gates told reporters. That’s the right attitude. I’ve been in favor of allowing reporters to record the return of fallen soldiers for years, and the Bush administration stand on this never made any sense to me. Yes, of course the pictures could be used to stoke antiwar sentiment, but the same can be said for any war-related photography. At the same time, they can also do just the opposite. But in a democracy, this is all irrelevant anyway. 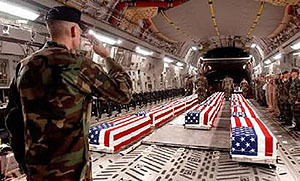 These are American soldiers fighting an American war, and the American public has a right to see the price of that war. This is a policy that deserves to be overturned forthwith.